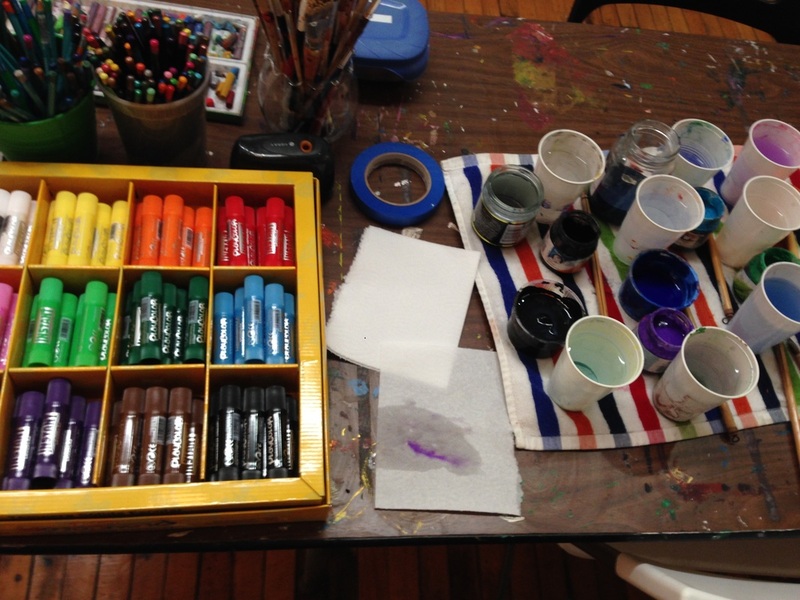 Art Therapy Studio Chicago, Ltd. - Blog Art Therapy Studio Chicago, Ltd. Many who struggle with an eating disorder, depression or anxiety are distracted by an inner dialogue. We all have an inner critic who sometimes helps us make better choices or to guide us and protect us, although for some the inner critic can be strong and get in the way of daily functioning. Some people daily deal with a critic that is harsh, cruel, self-defeating, blaming, and persistently negative. It is possible to build patience, and over time practice to begin learning new ways to build a different relationship with yourself. Doing so involves learning to acknowledge a thought for a thought, may not always based on reality, and to accept our natural human tendency of thinking towards a negative evaluation. True change comes by way in which you experience your life comes from shifting your perspective of seeing little things you go through day to day from a different lens. 1. Write a letter to yourself from an imaginary compassionate and validating friend about a specific area you critique yourself. To find more prompts read Kristen Neff’s Self-Compassion: The Proven Power of Being Kind to Yourself, 2015. 2. When your inner critic flares up practice turning the mind towards a more rational stance on the topic. 3. 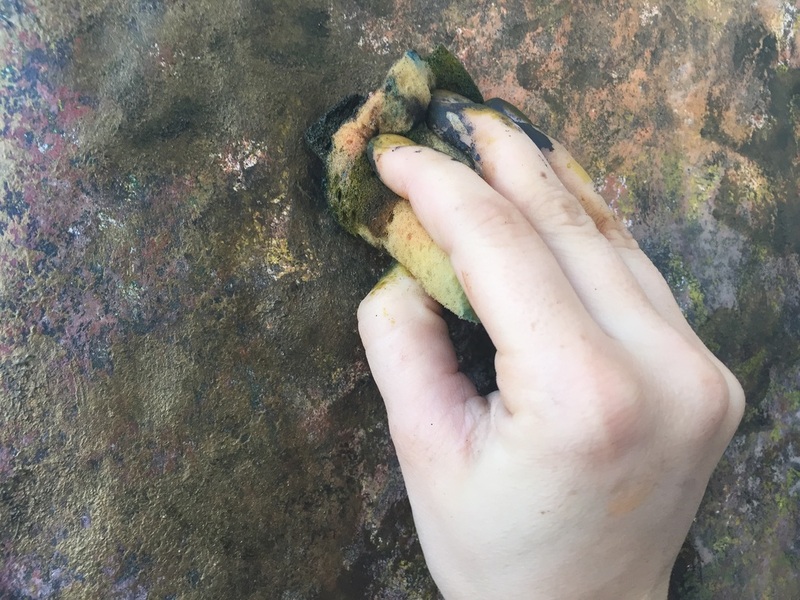 Set an intention to explore self-compassion through art making and allow yourself to approach the art materials with curiosity and openness to spending time on yourself. 4. Practice being kind to those areas of your body you notice yourself continuously judging by getting a massage, putting on lavender lotion, taking a bath, or taking a mindful walk and care for your body in all it does for you. 5. Intentionally share the peaks of your day with those around you when you notice your desire to vent or complain about what is not going well. 6. Find a non-judgmental listener to share your current challenges. 7. Remind yourself our minds are wired towards negative perception of events and challenge yourself to find an alternative more neutral perspective. 8. Sit on a park bench or eat lunch in the sun during your lunch break and enjoy your part of the day. 9. Identify personal goals for meaningful projects and take time once or twice a week to check off objectives towards those goals. 10. Affirm yourself for the work you do in all areas of your life especially on those days when you feel like you are treading water. Join me, Tricia Morales, LCPC, ATR at Art Therapy Studio Chicago (art-therapist.org) to create art as part of your practice of self-compassion. Try taking one hour a week to begin caring for yourself in a new way and see the difference it makes in the way you feel overall. Recently Mary Andrus, founder of ATSC was interviewed for a podcast on creativity with Beth Ann Short in Portland Oregon. We talked about so many topics, from relocating to Portland, Oregon from Chicago...to social action art therapy, state licensure, politics, encaustic painting, working in the field of art therapy and so much more! ​At the end of the summer, Art Therapy Studio Chicago was given the opportunity to interact with the attendees of North Coast Music Festival by encouraging them to engage in a collaborative group mural. The tent that ATSC offered was a safe space away from the chaos and confusion of the festival. This space provided individuals with the opportunity to come and express their current state of being without judgement. As an art therapist and facilitator of this mural, I was able to witness how the power of art making brought strangers together in a unique way. This space allowed participants to express themselves with the support of others and the ability to share a common ground. There are many benefits to making art with others. 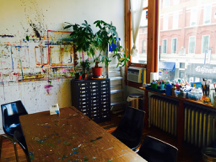 Whether it is a collaborative mural, or simply just sharing a studio space. The experience of being in a group offers the opportunity to make a connection with others. 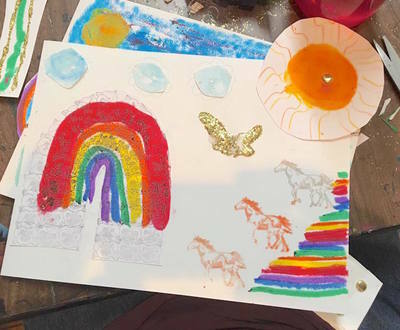 Art therapy groups provide support and can ease feelings of isolation and social anxiety because the materials and images can do the communicating. 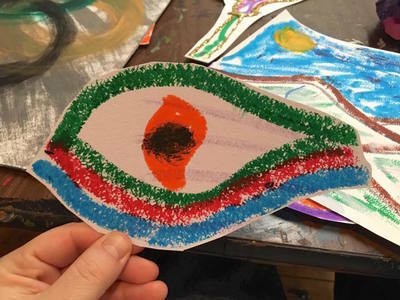 You can be actively engaged in an art therapy group without the need to be verbal. When choosing the right art therapy group for yourself, it is important to ask what you would like to gain from the experience. Do you want to use the group to gain insight from others? Do you want the opportunity to share your story? Each individual has their own needs. These needs can be met in a group setting if the individual is open and willing to trust the process. Art therapy groups can be formatted to fit a specific emotional need, population, or life event. You can find a group that connects you with people of similar interests and goals as yourself. If the idea of being in a group is intimidating to you, there are many groups that are offered with less structure. These types of art therapy groups reflect the style of an open studio. The choice to process in a group setting is left to the participant. You own the right to control your amount of self-disclosure. If you feel that group art therapy is an experience that will meet your needs. ATSC is currently offering weekly and monthly groups. We provide a safe, respectful, and comfortable environment. 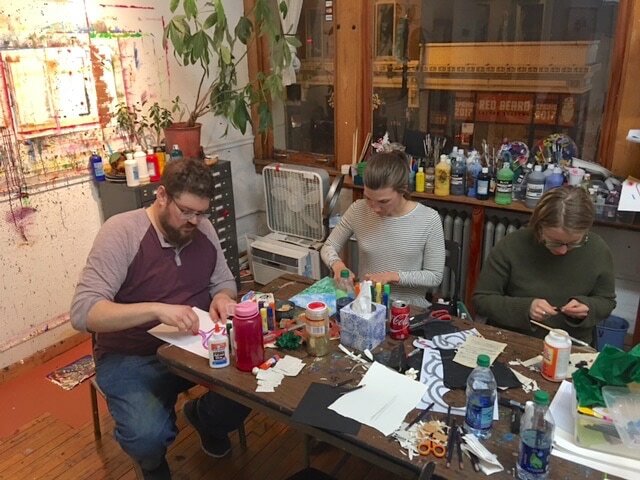 The time spent in the studio allows participants to let go of stress occurring in the outside world and be present with the time they are spending with themselves, others, and the artwork. Recently Mary Andrus, Founder was interviewed by Dana Mack, a Columbia College writing student. Click here to read her blog post. ​Technology is hurting us, making art can help. ​Not too long ago we lived in an era when there was a home phone, some people had an answering machine and very few people had home computers. If someone needed to get ahold of you right away, you might have a pager. In that instance you would have to try to find a pay phone and some change so you could call them back. You would actually schedule your evenings around when television shows aired, rather than having your DVR set to record it while you are out. You would listen to music on cassette tapes in our cars which were equipped with storage space for cassettes in the center console. Driving in the car was a time for reflection, road trips consisted of a time to connect, daydream or let our minds wander. Waiting at the doctors office was a time when you might pull out a crossword puzzle or pick up a random magazine. It was a time when we knew what it meant to be patient. Our brains were able to pause and rest from external stimuli. We were able to take time to journal, to reflect and truly be with ourselves and in relationship with others. We took the time to get to know the clerk at the post office, the cashier at the grocery store or the bus driver on our daily commute. Don’t get me wrong, for some, having this technology has helped us to feel more connected, but it also is very isolating. There are superficial demands placed on the image that we put out into the world and many become consumed with the living in this virtual world. What happens when we make art? We disconnect from the screen, we tune into ourselves, we tune into the people and things that are important to us and we create something that makes us fulfilled. We relax our hyper-aroused limbic system. We create something that makes us feel competent. We reflect on who we are as human beings. We see ourselves and others differently. We relax, we begin to accept ourselves and find our true authentic selves, one who can sit with the unknown, one who can transform pain, one who can take effective action and feel good about ourselves. We can find solace in the art, we can feel comforted by the art materials, we can have control over aspects of our lives that we feel powerless over. We tap into how we feel, we can express ourselves without having to develop the words to describe our inner experience. We learn to be patient. Art makes us feel alive. 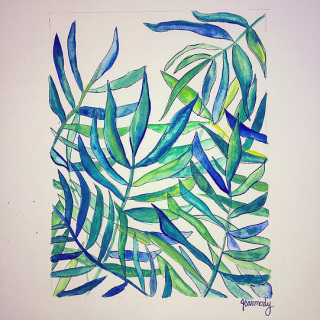 Art therapy can support you to reconnect with yourself and others. Think about ways you can bring creativity and imagination back into your day to day life. Take a walk, notice things around you that are interesting or beautiful. Take a few minutes to doodle in your notebook during a meeting, set a date with a friend to make a collage, allow yourself to play, give yourself permission to explore a new material. Go to the art store and wander. Join us for our next Meditative Open Studio on May 6th. Make art. balancing other people’s needs, or stretching ourselves socially, emotionally, physically, and financially. It may mean bringing up old feelings of grief and loss. We may feel the pressure of societal expectations of how we “should” be feeling and what we “should” be doing. As the New Year approaches we begin to reflect upon the past year, its challenges and triumphs, and prepare for changes to come. It is important to take time to care for ourselves during this time. In my work with others we spend a lot of time talking about the idea of self-care. What does self-care mean to you? How do you practice it daily? Are there ways you have already been practicing it and didn’t even realize it? What is one way that you could give yourself a break today, even just for a few minutes? We often talk about self-care as anything that you can do to take care of some combination of your mind, body, and spirit (if this part resonates with you). It can be something that restores you, fills you with energy, or gives you rest. At the close of session we may make and share a self-care commitments with each other. It can be helpful to say it aloud, to have your commitment heard by another, and to provide support and accountability. 1) Go outside. You can go for a walk alone, with a favorite pet, or someone you enjoy. If you have access to nature, or a street with trees, take advantage of it. Use this as an opportunity to notice the details surrounding you as you walk. Use this as a way to stay present. 2) Notice your breath. Take a moment to spread your arms wide and stretch. It can feel good to create more space to fill your lungs with air. Square breathing is another way to practice staying in the moment. Visualize a square as you breathe. Breathe in for a count of 4. Hold for a count of 4. Exhale for a count of 4. Hold for a count of 4. Repeat for few cycles. 3) Dance. Hop on YouTube and search for a new dance move to learn (some suggestions: The Bernie, The Robot, the Lean and Dab). Pick something that looks fun, makes you laugh, and gets you moving. Practice alone or with friends. 4) Take a hot shower or bath. Add a soothing scent with an essential oil like lavender or jasmine. Light some candle, bring a hot cup of tea, or turn on some relaxing music. Take some time for you to unwind and de-stress. 5) Scribble. Grab a piece of paper and a pen and spend a few minutes scribbling. Switch hands. Close your eyes. Let it all out. When you’re finished, tear it up, crumple it up, or fill in the spaces with colored pencils. This can be good for releasing frustration or discharging pent up energy. 6) Color. Adult coloring books have been all the rage lately, and they can be lots of fun. You can grab one, or print out a free mandala drawing online. Spend time coloring by focusing on the color and shape you are filling in. Use this as a way to take a personal break and to practice staying in the moment. 7) Notice your feet. If you feel your anxiety or stress mounting, take a moment and reconnect with your feet. Put them flat on the floor. Press them into the ground and feel your leg muscles engage. Imagine tree roots sprouting from your feet and into the floor. Wiggle your toes. Wiggle just your right toes, then just your left. Wiggle your toes super fast and then ultra slow. Notice how you feel in your body before and after. 8) Cook a meal. Look up a new recipe you would like to try or revisit an old comfortable favorite. It can feel good to set a goal and accomplish it, while nourishing your body. Choose to savor it alone or share it with people you love. 9) Unplug. Turn off your cell phone. Log off the computer. Turn off the TV. Do it for an hour or for a whole day. Give yourself permission to say no and to check out. 10) Express gratitude. Take a moment to consider someone in your life for whom you are grateful. Consider calling them or writing them a handwritten note to express your gratitude. It can feel good to share appreciation with others and shift our focus to towards gratitude.